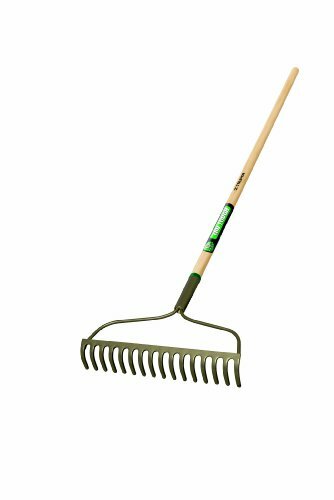 Truper 33038, R-16AME-S, Tru Tough Welded Bow Rake, 16 Teeth, Wood Handle , 54-Inch. 54-Inch North American Ash, lacquered handle for strength and durability. Welded 16 teeth bow rake . Clear-coated gray-steel finished heads. Spray clean with garden hose, coat with silicone spray. Tru-Tough: Trupers Best Selling Signature Tool Line!. Truper has been in the hand tool manufacturing business for over 40 years and is by far the largest Mexican company in its field. Truper relies on the most advanced modern and efficient technology to guarantee the optimum quality and value of its products and demanding service needs of the company-Feets global customers. Tru Tough provides everything a dedicated handyman expects from a serious, long-lasting tool at an unbeatable price. Tru-tough has long been Trupers best selling products. The visual appeal is highlighted by clear-coated gray-steel finished heads, steel collars, lacquered ash handles and heavy duty D-grips. A ten-year free-replacement warranty backs all Tru-tough tools.